One lovely August day in 1997, Leah set out in her Suzuki X-90 for a 2,500 mile trip from the mountains of NC to Carlsbad, CA. On her way, she met up with relatives to ride in a town parade in her sister's muscle car. The trip gave her plenty of time to regret leaving her 21 yr-old son in charge of her house- sheesh! However, the hills of California lightened her spirits and she started her training at GIA. After tedious training by the world's Master Jewelers, and plenty of hot-plate suppers, she directed her X-90 back to North Carolina. Once there, she outfitted her studio and got to work. Please enjoy your visit to the online studio and comment on what you see. 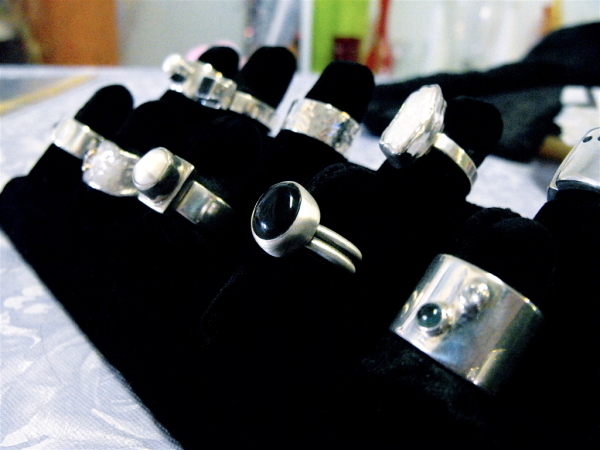 Many pieces shown are available for purchase, and custom design is Leah's specialty. If you see a piece you like, or a style you like, get back to us with your request and we will forward requested availability and prices. The more we know about you the quicker we can help! Please answer all fields on the contact field as completely as possible. Your privacy is of utmost importance to us. Be sure to ask about our First Time Visitor special, as well as our Send Your Friends referral program. Cheers!